Training for accredited certification that allows you to work in confined spaces that are hazardous-gas free at the time of entry under the Water UK scheme. Delegates can choose to take either the entrant operative option or the non-entrant top man option. 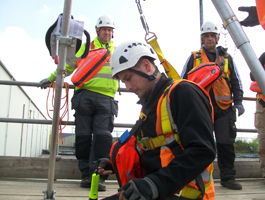 This course is suitable for persons nominated to work in Confined Spaces, where work has been assessed and classified as NC2 OR NC3 under the Water UK scheme. Delegates of the course can choose to take either the entrant operative option or the non-entrant top man option. To provide you with the theoretical and practical training where you may have to work in a confined space that is hazardous-gas free at the time of entry. You will be tested on the above both in theory and practice.